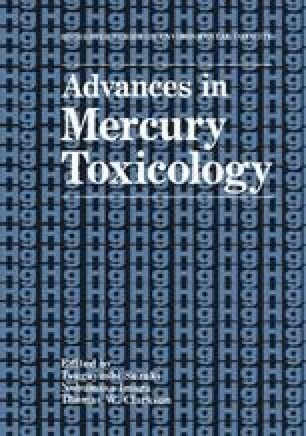 Since methylmercury (MeHg) has a high affinity for thiol compounds, the metabolism and transport of glutathione (GSH) and its derivatives are important for determining tissue distribution and elimination of MeHg in organisms which are challenged with this toxic compound. Our studies revealed that the rate of MeHg secretion from tissues seems to correlate with the rate of tissue efflux of GSH. The transfer of MeHg from extrarenal tissues to the kidney is important for its urinary excretion. Although intracellular MeHg seems to be secreted into the circulation as its GS-conjugate, a significant part of plasma MeHg was identified as its albumin-conjugate. Since rapid exchange reaction of an SH-MeHg conjugate with other thiols occurs, the molecular form of a MeHg-conjugate would be changed by the presence of other thiol compounds. There may be two mechanisms for renal uptake of MeHg; the one via glomerular filtration followed by its luminal absorption and the other by non-filtrating peritubular uptake. It has been suggested that a reaction catalyzed by γ-glutamyltransferase (γ—GTP) and probenecid sensitive transport system may be involved in renal uptake of MeHg. Since urinary excretion of MeHg showed a marked lag period, some non-filtrating mechanism may play an important role in renal uptake of MeHg. Renal brush border membranes have a secretory transport system for GSH and its S-conjugates. Since the rate of urinary elimination of MeHg changed significantly with concomitant changes in the secretory rate of renal GSH, MeHg may be transported to the luminal space via GSH transport system as MeHg-GS. The major part of urinary MeHg was accounted for by its cysteine (CySH) conjugate. In the luminal space, MeHg-GS may be transformed into its CySH conjugate according to degradation of GSH and then excreted in urine. The mechanism of renal uptake and urinary excretion of MeHg will be discussed in detail.